Everybody wants a little analog in their life. Whether you're a professional musician hoping to bring some "authenticity" to your largely in-the-box studio, or you're a hobbyist turned on by the idea of subtractive synthesis, there's no doubt that adding a vintage analog monosynth to your setup will offer you a richness of sound that may have been lacking before. Deep bass, searing leads, wild effects—all this and more are possible with an analog monosynth. But not all of us can afford a Moog Minimoog, Arp Odyssey, or Sequential Circuits Pro-One. Sure, there's the new synth route, with plenty of modern and affordable monos to choose from, but they're not vintage, are they? For better or for worse, they don't have that cool cachet. If it absolutely has to be vintage, then what's a budget-conscious musician to do? I humbly suggest considering a Japanese monosynth. While not all Japanese monos are affordable, the following six are, with most topping out at around $500 or $600 USD. Given their country of origin, they tend to be well-made, with most needing just a periodic cleaning or some light maintenance to be kept in good working order. And they're plentiful, meaning that they're relatively easy to find. Best of all, many of the synths listed here have a fairly unique sound, which can only help differentiate your music from others. Everyone has a Minimoog and an SH-101, but not everyone is making music with one of these machines. In the late 1970s, consumer audio equipment manufacturer Technics decided to get into the synthesizer business with its SY-1010, a monosynth aimed squarely at the novice. Sold at consumer electronics shops in Japan, the diminutive SY-1010 is lightweight and made largely of plastic. Its 2.5-octave keyboard (F to C) won't necessarily impress anyone, nor will its architecture, which is exceedingly simple. Don't let your guard down, though, as its simplicity belies a characterful sound. It starts with a single VCO, which has only one waveform: sawtooth. The VCO is set with a tuning pot, which sweeps from below 100Hz to above 4kHz. Oddly (for a single oscillator synth), there's also a fine-tuning pot. Should that not be enough, it offers an A440 tone to help balance things. There's only one ADSR envelope to handle both filter and VCA, with a single LFO and mixable noise rounding things out. If you judged the SY-1010 based only on its looks, you'd be missing out. Yes, it's extremely limited, but its LFO is pretty darn fast and can affect pitch, volume, and filter. The filter is a marvel, too. It doesn't scream so much as whistle, but it's great fun to sweep. To me, the synth has an almost melancholic quality to it. If that doesn't do it for you, it's great for wind effects, and with its initial gain knob it'll do drones for days. In short, the Technics SY-1010 is a simple yet surprising synth, and with a current price of around $200 to $300 USD, it's very affordable. I like it so much I have two of them. Aside from the vaunted CS-80, Yamaha's pre-DX7 synths don't get a lot of attention, which is a shame when you consider just how rich and deep the CS line is. With everything from giant polys like the aforementioned CS-80 down to the digital-hybrid CS-01 (see below), the CS line has something for just about everyone. For the budget-minded musician, you could do a lot worse than the CS-10. It's built like the proverbial tank, for one. It also looks the business, with its black, angled chassis and gray and orange silk-screening. The keys feel nice, but more importantly, the sound that comes out when you play them is pure joy. Although there's only one VCO, the two waveforms (sawtooth and square) can be freely blended like a Minibrute. There's also pulse width modulation, which really livens up the sound—especially bass. And speaking of, the CS-10 has quite a range: 2' down to 64', so you can entertain everyone from the neighborhood dogs to the downstairs neighbor. The multimode filter (low-, high- and band-pass) is gorgeous and smooth, and while it won't self-oscillate, it will make you smile. The envelopes are definitely worth mentioning. There are two, with a dedicated filter envelope. This features Yamaha's unique initial level and attack level knobs, along with the usual attack, decay, and release. It's a little tough to get your head around the initial level concept, but it adds extra emphasis to the attack portion. Additionally, both of the CS-10's envelopes have two lengths, regular and 5x time, which means they can do both snappy and ridiculously long. Lastly, the LFO (sine and sawtooth) goes into audio rate and can modulate the VCO, filter, and VCA for tremolo effects. The CS-10 is a flexible and musical monosynth that deserves much more attention than it gets and is well worth the going price of $300 to $500 USD. Also worth a look is the CS-5. It only has one envelope, but it does have sample and hold, which its big brother does not. The baby of the CS family, you'd be forgiven for thinking Yamaha's CS-01 was a toy keyboard. With its slim styling and mini keys, it looks a bit like a Casio. I mean, it even has a built-in speaker. Its sound, however, is anything but toy-like. The CS-01 isn't entirely analog. Its single oscillator (triangle, sawtooth, square, pulse, and pulse width modulation) is digital, so in that sense, it's a little like a home keyboard. But that's where the comparisons end. It's a bass machine, and you need it for the pulse width modulation alone. It's gargantuan. The filter is lovely and decidedly sweepable, although it's a shame that the resonance only has two settings: high and low. (Pro tip: open it up and tweak the resonance trim pot a touch.) The second-generation unit released in 1984 addressed this filter issue, adding a full resonance slider (although these units are fairly rare). It's regrettable that the CS-01 was released before the invention of MIDI because if any synth is crying out to have its filter cutoff tweaked while pumping out a deep bass line, it's this one. Aftermarket MIDI kits are available, although there's very little room inside to work with. However, at only around $300 USD, this is still very much a bargain. While the most common color is gray, try to find the black one—it looks slightly less like something that you might find under the tree on Christmas morning. The market for synthesizers in the 1970s was a little different than it is today. One chief difference was the phenomenon of "preset" synths, with a selection of pre-programmed sounds that the gigging musician was likely to need built-in. With no memory, this was the best it got in the 1970s. Pretty much every manufacturer—from Arp and Moog to Roland and Yamaha—had its own preset synthesizer. Korg's entry into the preset market was the M-500 Micro-Preset: a small (even by preset synth standards) monosynth that was basically just a three-octave keyboard with a box on the left-hand side. Controls were rudimentary at best. You had to make do with portamento, a limited AS envelope, LFO for vibrato, a repeat (loopable envelope) toggle, and a cut-down version of the "traveler," which was Korg's odd cutoff/resonance combo slider. Presets are arranged in a five by seven matrix, with a row of push buttons on the bottom and a footage selector to choose the row you want. The presets are not inspiringly named (recorder, bassoon, trombone), but the good news is that they're not particularly realistic either. What you do get are a selection of quite nice mid-'70s Korg synth sounds, including two columns of dedicated synthe 1 and synthe 2 (well, almost dedicated, as synthe 2 is interrupted twice by noise effects). The M-500 also allows you to push in two buttons simultaneously to create hybrid sounds, which extends its sound palette considerably. Granted, the M-500 isn't for everyone. It's strictly for the musician looking to recreate a very specific, vintage-1970s synthesizer sound. I've noticed an M-500 in synth god Kebu's rig, and of course OMD famously made a number of their early records with one. It really does sound fantastic though, and at around $500 USD it's pretty much the only affordable way to get the sound of pre-MS-20 Korg now that everyone knows about the MiniKorg 700. If you require an onboard speaker, the M-500SP version will do you nicely. It also has a lovely olive green face. This is an odd one. Teisco is probably best known overseas for its guitars and amps but the company also released synthesizers, sometimes confusingly branded Kawai (which had bought the company in 1967). 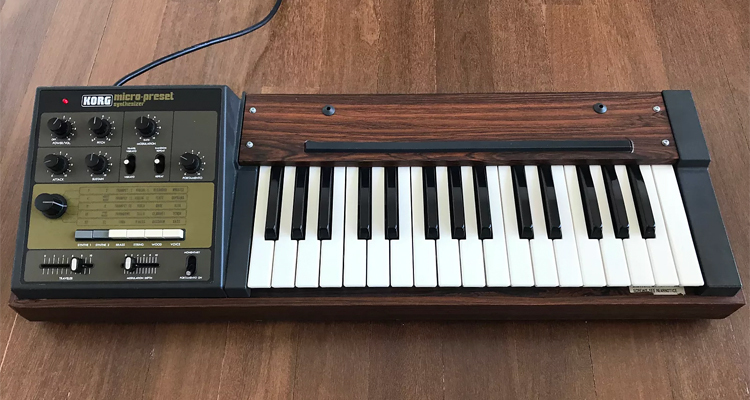 Like the Korg M-500, the S-100P is a three-octave preset synth—this one, with rainbow-colored toggle switches arranged under the keyboard, as synths were often sold in the 1970s to be set on top of an organ or electric piano. The sounds are along the lines of what you'd expect from a 1970s preset synth—your typical emulations of things like oboe and violin. But it also has more exotic sounds like sitar and shakuhachi, plus a formant-filter voice sound and four "synthe-sound," selections which are very nice indeed. You get control over the filter (as brilliance) and portamento, plus things like sustain, hold, and glissando. There's a flanger, which is welcome, although no control over parameters sadly. It even has a built-in spring reverb, just like your Grandmother. But what makes the S-100P especially odd is that it shares lineage with the ARP Pro Soloist, specifically the aftertouch system. Or, at least, that's the rumor. It's hard to find any declarative proof for this, but my unit does indeed have a sticker on the bottom saying, "Manufactured under license from ARP Instruments." It certainly shares the same aftertouch nomenclature with the Pro Soloist (growl, wow, brilliance, etc.). The S-100P is a curiosity for sure but one that will reward you with unique sounds. Plus, it just looks dead cool. Although they're rare, they're also not that well-known, which is keeping the price low at around $400 to $600 USD. Of all the monosynths listed here, the SH-09 from Roland is probably the most suited to bass. Although it only has one oscillator (capable of ramp, square, pulse width modulation, or noise), it has a sub oscillator, which can go one or two octaves down in either square or pulse width shapes. Roland has a reputation for "polite" synths, and while I find this to be true in their later polys, the bass here is beefy enough to get the job done without asking permission first. If this was all the SH-09 could do, it would still be worth it. But despite its simple appearance, it's capable of quite a bit. The Roland filter is smooth and juicy and will self-oscillate, giving you an extra sine wave to play with. The single ADSR envelope has two modes and can be controlled by the LFO. The filter can also be modulated by the LFO, as you would expect, but polarity can be reversed, allowing for some interesting filter sculpting. The filter also has an envelope follower for tracking external signals. Lastly, with CV and gate, the SH-09 can easily be controlled by other synths, or with a MIDI-to-CV converter like a Korg SQ-1 you can control it from your DAW. With all this firepower, why is the SH-09 still within reach? In a word: siblings. The SH-09 is positioned between the more popular SH-2 and SH-101. The former has two oscillators and the latter has the sequencer and cool kid techno cred. The SH-09 is still a Roland, though, so at around $700 USD it's not cheap, but it is the most affordable way to get that Roland monosynth sound. Not all of us can afford the more sought-after machines, but that doesn't mean we can't still enjoy making music with vintage analog monosynths. With a little bit of research and some thinking outside of the box, you'll find there are still plenty of deals to be had. There's a lot of life and music left in these synths. They're just waiting for the right open-minded person to come along and scoop them up. Please note that if you import your synth directly from Japan, you may need some kind of a solution for the difference in voltage (Japan is 100V)—either by changing the internal power supply to one that matches your local voltage or using a converter. Adam Douglas is a musician and synthesizer fan based in Tokyo, Japan. He writes about synths on his blog, Boy Meets Synth.